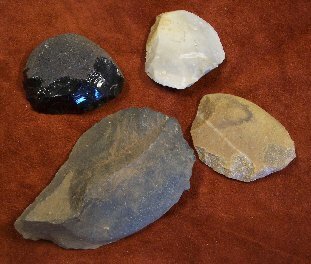 The Art of Flintknapping involves the production of many types of stone tools above and beyond projectile points. The items on this page are replications of actual artifacts for use in the classroom, at guest lectures or for museum exhibits. The tools offered below are specifically of the flaked variety - both percussion and pressure. These tools are available in a labeled Riker Mount, if noted as an option. Most of these tools can be put to their traditional use or can be specially requested to be previously used for comparative analysis purposes or display. These tools are generic varieties, for more specific artifact replications of era or regional types see the Specific Tool Replicas page. 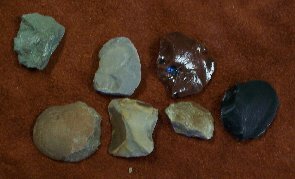 Please CONTACT US or use this Special Request Form (pdf) to obtain a quote for the replication of any other stone tools you might be interested in. Dr. "Arizona" loves a challenge. Remember that there will be a month delay in the shipping of any of the items offered on this page. 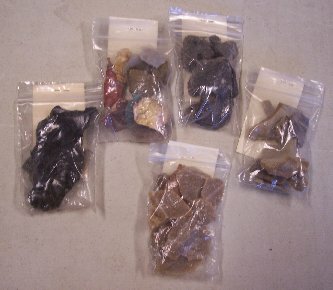 Flake Tools are modified large Percussion Flakes. Such tools were once utilized to scrape and/or cut soft materials like leather or plant tissue. The working edge is sharp, with the handling edge purposefully dulled for grasping. 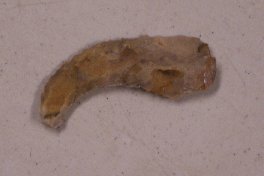 The actual shape of this tool is highly variable due to the shape of the original flake. The size varies but generally fits an average hand. These tools are made out of a wide range of materials. Core Tools are modified large Core Fragments. Such tools were once utilized to scrape and/or cut soft materials like leather or plant tissue. The working edge is sharp, with the handling edge purposefully dulled for grasping and usually shows cortex. The actual shape of this tool is highly variable due to the shape of the original core. The size varies but generally is quite large. These tools are made out of a wide range of materials. These tools can be used to punch holes in leather when made out of Obsidian or drill through harder materials including shell and soft rocks if made out of CCS. The shape of this tool varies widely but always has a thick triangular cross-section. Comes in a labeled shadow box. These tools are specifically designed to be hafted upon a drill shaft but can also be used by hand to drill through shell and soft rocks. It has a thick triangular cross-section. Displays much finer flaking work than the generic drill offered above. These specific drill types are produced by the alteration of a former arrowhead, either due to use or production breakage. Due to the base notching it can be said to be specifically designed to be hafted. It has a thick triangular cross-section. Most regions had some retouched arrowheads in this manner. Base style is not offered as an optional selection here. They typically are side or base notched. These drill bits are specifically designed to be hafted into a drill shaft to drill through shell and soft rocks. It is a small (about a half inch) straight CCS bit with a thick triangular cross-section. 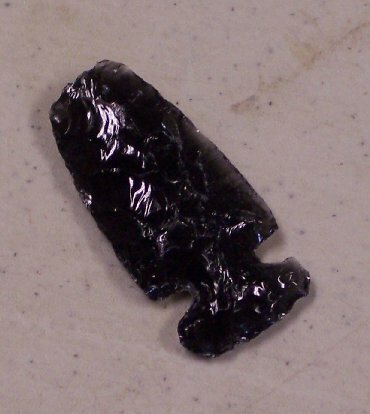 This is a specific unique form of arrowhead that has a wide blunt front edge instead of a point. The base styles are similar to all the various regional varieties. Most regions had some retouched arrowheads in this manner. 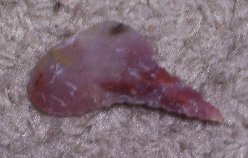 This form of arrowhead was used in hunting birds with the goal being knocking the bird out of the air rather than causing it physical damage. Base style is not offered as an optional selection here. This artifact is a modern replica of an archaeologically discoverable tool which was used for scraping leather or plant materials. 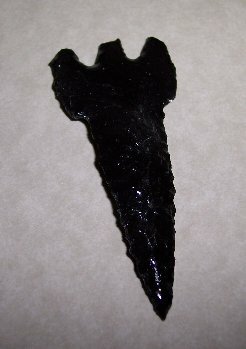 The working distal end of this Obsidian or CCS tool is high angled with the sides purposefully dulled for grasping in the hand. Sometimes called a "Duckbill" style scraper. This artifact is a modern replica of an archaeologically discoverable tool which was used for scraping leather or plant materials. 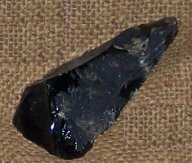 The working side of this Obsidian or CCS tool is high angled with the other side purposefully dulled for grasping in the hand. This artifact is a modern replica of an archaeologically discoverable tool which was used for scraping leather or plant materials. 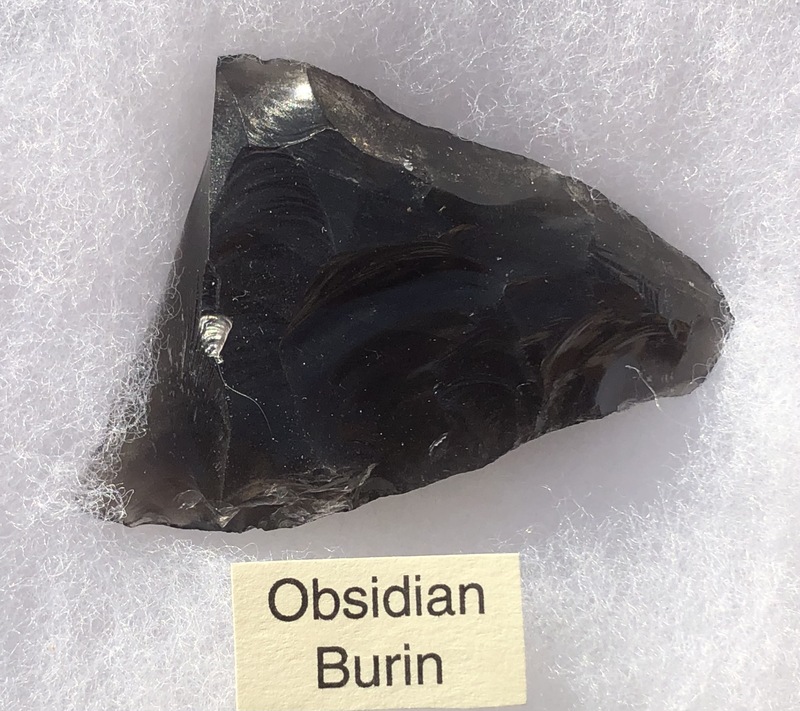 The working side of this Obsidian or CCS tool is high angled. The overall size is small and is grasped between the thumb and forefinger when in use. These specific scraper types are produced by the alteration of a former arrowhead, either due to use or production breakage. Due to the base notching it can be said to be specifically designed to be hafted. It has a high angled and wide front edge. Most regions had some retouched arrowheads in this manner. Base style is not offered as an optional selection here. A medium to large size tool used for scraping. The shape is a curved blade out from a widened handle section. A spokeshavee will come within a Riker display. 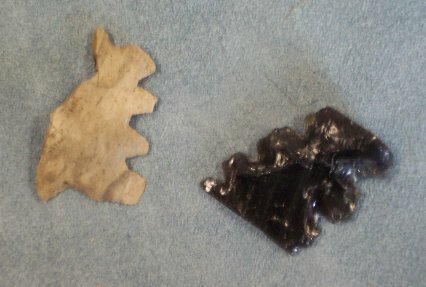 This basic chert, quartzite or flint flake can be used with a high-carbon steel rasp (not yet available) to produce the sparks necessary to start a fire. Striking such a steel removes a piece of steel as a spark that can be used as the ignition point. 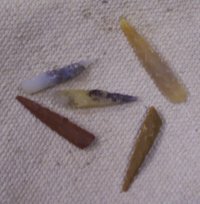 This selection of ten relatively small flakes (1 to 2 inches) are ones that can be used to work a variety of materials since they have at least one very sharp edge. Also available as a Comparative Collection. Unlike that collection, these flakes have not been previously used. 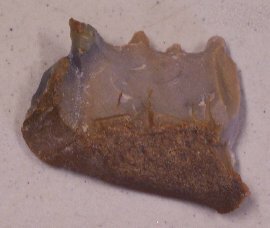 This tool is a small utilized flake that has multiple sharp points along the edge. It was used to engrave grooves in soft rock or leather, such as scrimshaw. Comes in a labeled display box, except for the set of ten. This tool is a medium-sized utilized flake that has multiple sharp points along a straight edge. It was used to saw through materials or create grooves in soft rock or leather. Comes in a labeled display box, except for the set of ten. This tool is a type of graver that is produced by the alteration of a former arrowhead, either due to use or production breakage. Due to the base notching it can be said to be specifically designed to be hafted. It has a thick triangular cross-section to the "perforator. 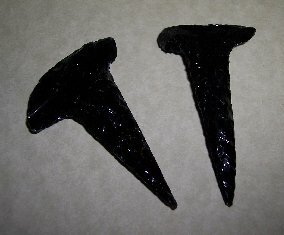 It has been suggested that the sharp tip was used in tattooing or alternatively for leather punching. 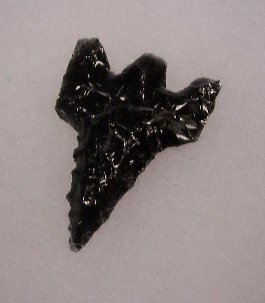 Most regions had some retouched arrowheads in this manner. Base style is not offered as an optional selection here. This tool is a medium to large size lammelar percussion flake, the edge of which was used for cutting and not scraping. The length-wise cutting edge has no secondary flaking but is the original extremely sharp edge. Comes in a labeled display box. This tool is a medium to large size percussion flake, the far edge was specially fractured to produce a sharp edge that has not been secondarily flaked. Comes in a labeled display box. 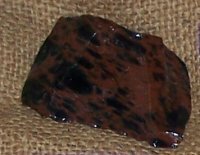 An irregularly shaped and notched flaked object concerning which there are a multitude of theories regarding its use and manufacture.